Following two full years of unsuccessful negotiations, 30,000+ teachers in L.A. have walked out on their jobs. More non-teaching staff - Schools don't have full-time nurses, librarians, and counselors, often sharing them between multiple sites. Students need these services available all the time in order to succeed and feel nurtured. Oversight on charter schools - The city has shifted toward privatization, handing a lot of control over to private charter school companies. That diverts funds and the accountability for students isn't always there. Teachers have seen the quality of education decrease over the years, and they attribute it to these factors. We have an obligation to provide kids with at least an adequate (if not great) education, particularly to underserved communities of color like we find in Los Angeles. 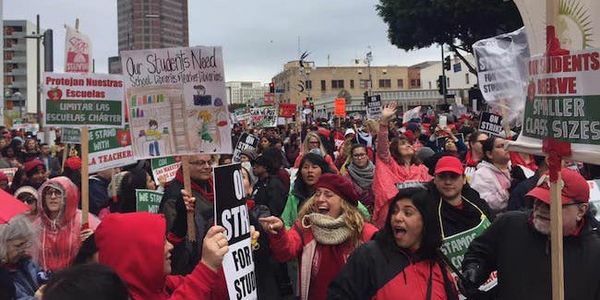 LAUSD needs to find a way to pay their teachers fairly, get nurses, librarians and counselors back into schools, and put the entire educational system back on track. We support the teachers in taking this bold stand for their students and ask LAUSD to meet their demands.